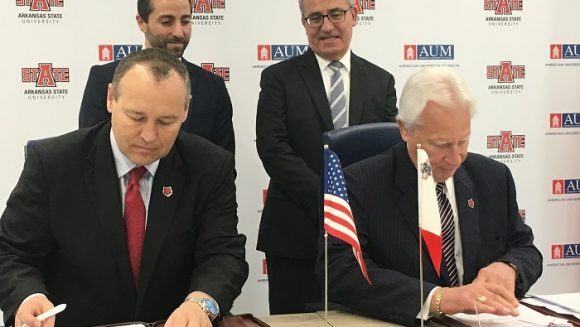 The American University in Malta (AUM) and the Arkansas State University in the United States have signed an agreement for the two institutions to exchange their curriculums as well as to exchange students and lecturers. Among other provisions, the agreement also provides an opportunity for students to study for two degrees offered by the universities and enables them to study in both campuses and eventually to graduate from the two universities. This agreement was announced two weeks after the AUM’s inauguration and gives its courses a further American touch. Students following courses in finance or business administration will among other things also be able to study and obtain credits online from the Arkansas University. The AUM President Dr Lewis Walker said students are also to be given the opportunity to spend study time on the Arkansas campus in the US and vice versa. Dr Kelly Damphousse, the Chancellor of the Arkansas State University signed on behalf of the US University and said this is the first step by the university to expand its role in Europe. He said the two courses will be advertised among students and will enable them to spend two years studying at AUM and then return to Arkansas to finish off their studies. The Chancellor also added the agreement will enable Arkansas students to spend short holidays in Malta in summer or winter with the emphasis remaining on the study element. The Minister for Education, Evarist Bartolo, said the agreement will draw students from around the world and this will help enhance Malta’s reputation in the educational sphere.